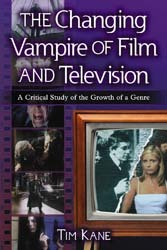 Just when you thought life couldn’t get any stranger, along comes vampiric fish and blood sucking birds. In the spirit of all things creepy, I’ve scoured the realms of fauna to find all the bloodsuckers out there. And I’ve saved the best to start us off. Although no bird on Earth draws all its nourishment from blood, the sharpbeaked ground finch will occasionally delve into vampirism. 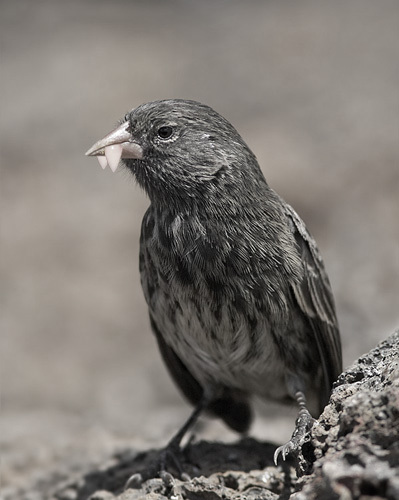 This bird lives on an island already known for its freakish deviants of evolution: Galapagos. Typically the “Vampire Finch” will peck at seeds, just like a normal bird. But in the light of a full moon… Er, when drought conditions limit the number of seeds available, it switches to the red stuff. 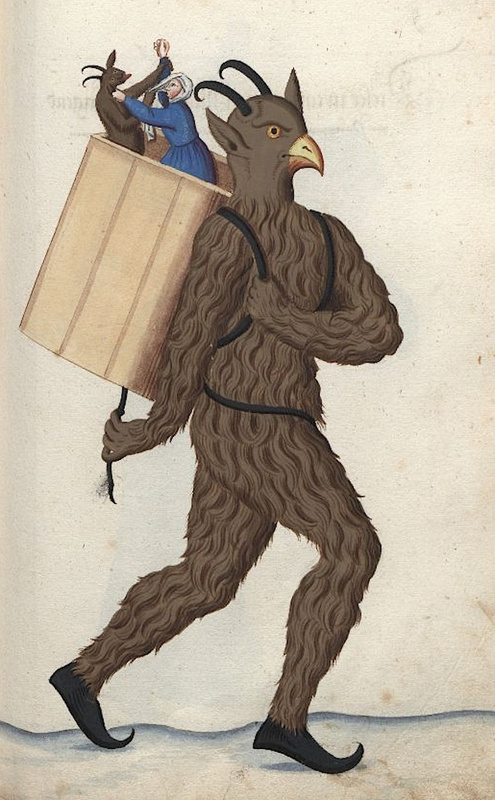 Then it mosey’s over to another fowl, a seabird called a booby. The finch pecks at the victim bird’s back until it draws blood, offering up a nice warm meal. The sharpbeaked ground finch never over pecks. They only draw enough bloom to eat. 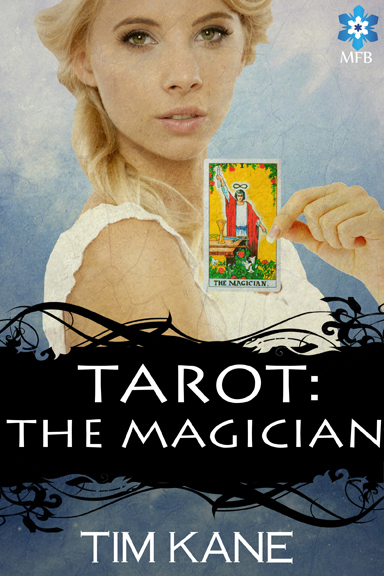 If the finch were to cause too much pain, then the booby would chase them away or attack. This National Geographic video shows the vampiric finch in action. The candirus (or pygidiid catfish) is strongly attracted to raw turtle meat and will also attack the legs of human waders. These fish crave blood and will attack the gills and fins of dying or disabled fish or even the legs of submerged children. Scientists, Vinton and Stickler, caught a specimen using a bloody cow lung for bait. Another scientists captured one as it tried to rasp the skin of his leg. Generally, these vampire fish seek out larger catfish, burrowing into the gills. One specimen was found halfway inside the belly of a larger catfish. The vampire catfish’s belly was distended with blood. In 1960, one researcher captured a canirus catfish and “permitted [it] to fasten onto his hand for a short while during which time it succeeded in drawing blood, apparently using its mouth as a sucking apparatus and rasping with the long teeth in the middle part of its upper jaw.” It seemed, he added, “to be utterly avid for a meal of blood and had to be forcibly removed.” So unlike the finch, this bad boy loves the taste of blood. It gets better. In 1959, the Cleveland Aquarium acquired four vampiric fish. The keepers tried to feed them anything from worms to brine shrimp. No go. The canirus would have none of it. Only when a half-pound goldfish was put into their aquarium, did they bite. Almost immediately, according to the report, three of the four latched onto the goldfish under its gills and began sucking blood. So vampire bats do not have the corner on the creepy bloodsucking market. Imagine spending all day, every day, writing. That was the lot for many Medieval monks. It was grueling work, so we can’t begrudge them a little levity in the margins. 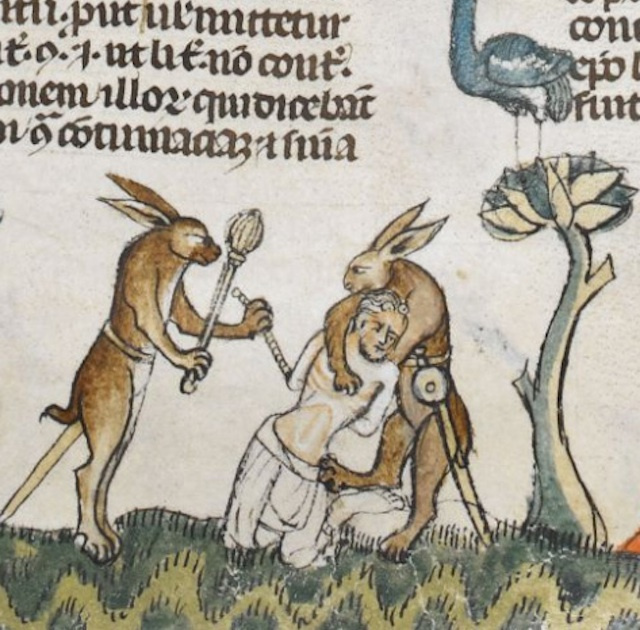 The illustrations that adorn illuminated texts go from the silly to the downright bizarre. Here are some of my favorites. 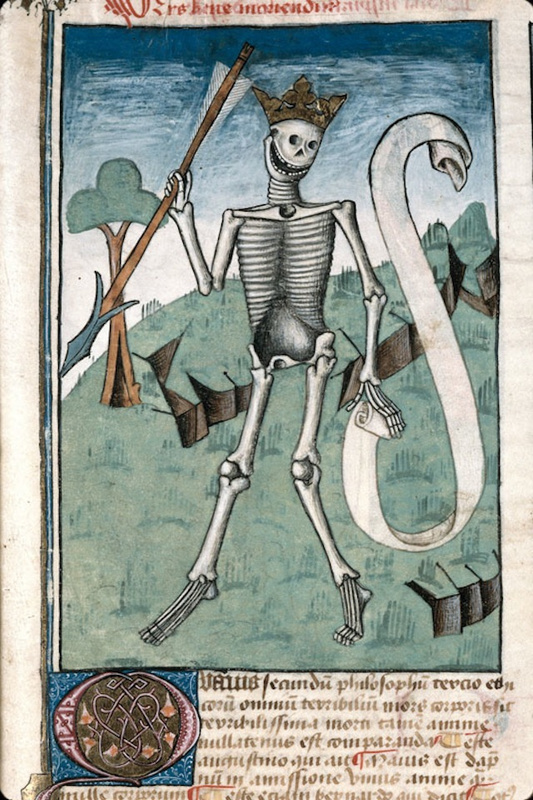 I included this skeleton from Ars bene moriendi (France, 1470-1480) mostly because I love skeletons. 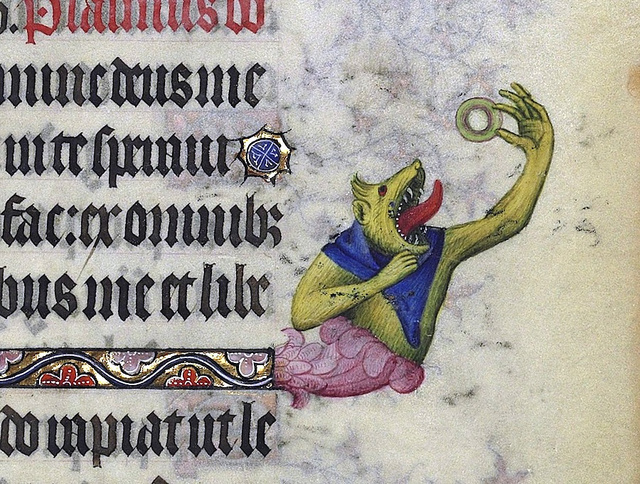 Here we have what appears to be a demon (or monster) eating a doughnut. 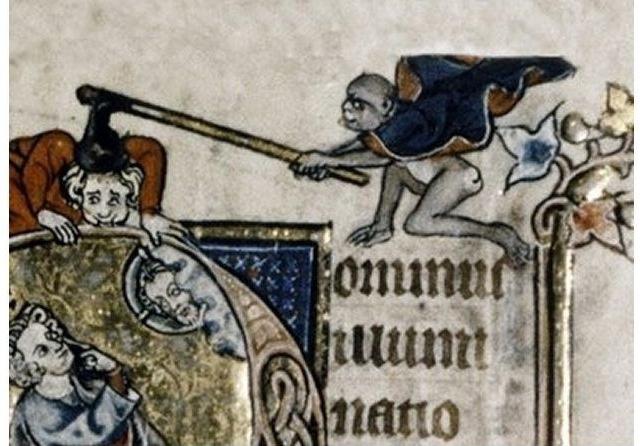 This is from Les Grandes Heures du duc de Berry, Paris, 1409. 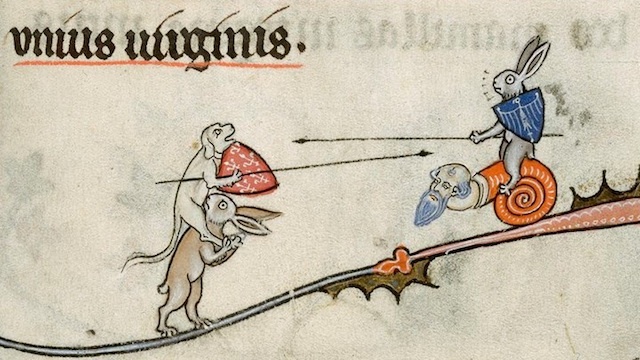 There seems to be a trend in Medieval illuminations of animals attacking people. We also see many examples of animal warfare. 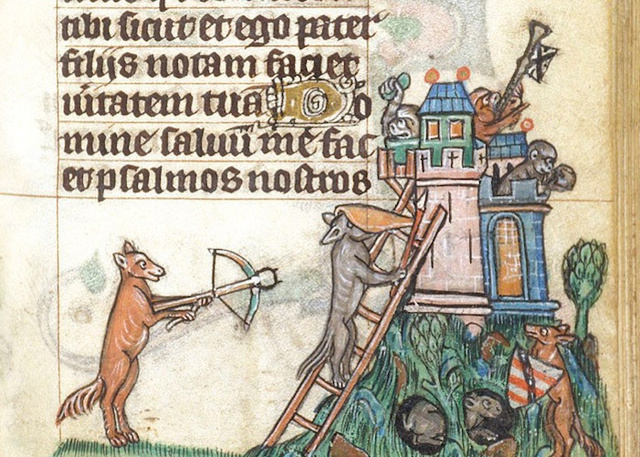 Here, foxes siege a castle of monkeys from a 13th-century Bible. 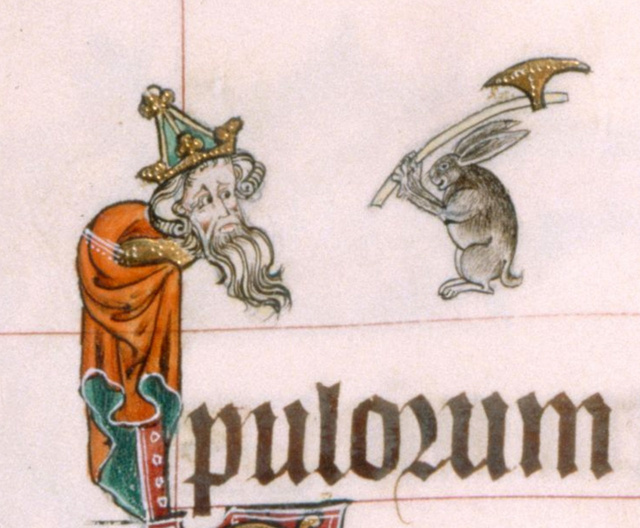 A dog and a rabbit joust. Source unknown. And then there are the snails. Seriously. Many many illustrations show knights battling snails. Scholars are baffled as to the significance. 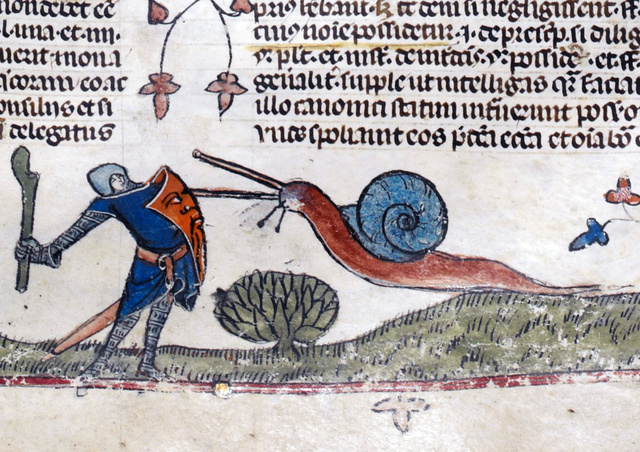 A knight about to slay an monstrous snail from The Smithsfield Decretals, decretals of Gregory IX, Tolouse, c. 1300. Illuminations were added about forty years later in London. 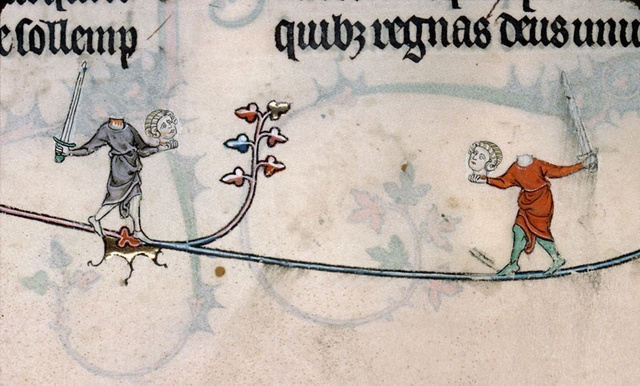 So the next time you see a snail, pull your sword. Love. Death. Betrayal. And Giant Snails. Is the Steampunk Mechanical Hand a Reality?